ClearOne, the company that first brought you wireless tabletop conferencing, now brings you another first in innovation. Only the ClearOne MAXAttach™ conferencing system provides unprecedented expansion capabilities to ensure complete microphone and loudspeaker coverage. No matter where participants are seated, conversations are natural and effortless. 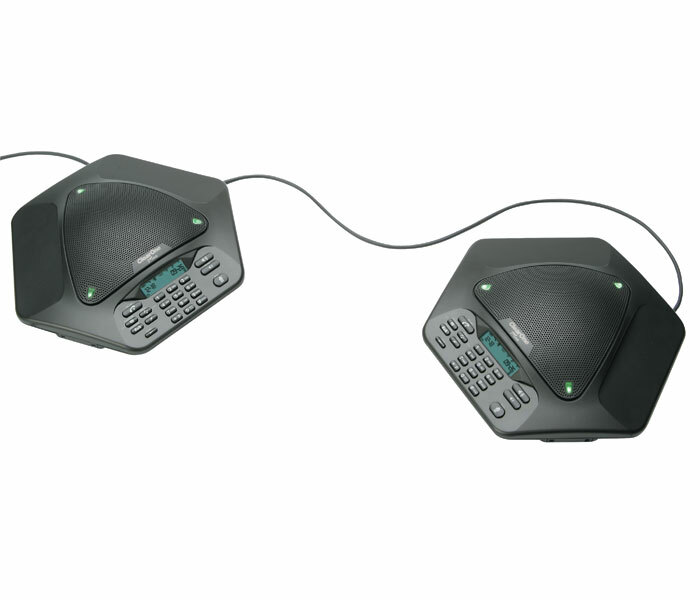 The two phone units included in the MAXAttach conferencing system enable even distribution of microphones and loudspeakers as well as centralized access to dialing, mute and volume controls.The MAXAttach features advanced audio technology typically found only in high-end installed audio systems, including Distributed Echo Cancellation®, noise cancellation and advanced microphone activation processes. Truly a “one size fits all” conferencing solution. It comes with two phones, for greater coverage in larger conference rooms, and can also be expanded up to four linked phones using the MAX EX Expansion Kit. Additionally, the two phones can be used in separate rooms with the purchase of an extra power supply base unit.